 This sermon, “Hunger and Poverty in Cincinnati,” was originally delivered to the congregation of Harmony, a Unitarian Universalist Community, on April 15, 2018. It is published here with permission from the writer, with all rights reserved. Poverty and hunger are closer than you’d expect them to be. Most of you know that our family moved from Liberty Township down to Northside around a year ago. In case you don’t know where that is, it’s between exits 4 and 6 on I-75. We’re now in the city of Cincinnati proper and wanted to get more involved in local issues and find out what we could do to help. Shortly after moving in, I met Emily while she was out on a walk. She introduced herself and we chatted for a little while. 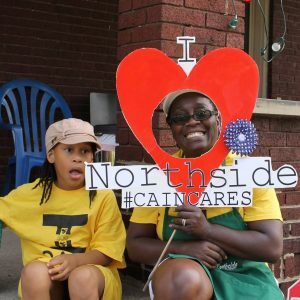 As we talked, she mentioned that she works at CAIN (Churches Active in Northside), a non-profit just around the corner from our house. More on their mission later. The move to an urban neighborhood has given me a different perspective in many ways. I feel like when we were in the suburbs, we didn’t see much poverty or hunger first-hand. One of the reasons people live in places like that (if they’re able) is that you can build your suburb experience however you like: find a nice subdivision with an HOA, maybe a community pool. You have a lot of control over what is in your environment, and what—and who—you allow into it. It isn’t even that difficult, since by and large the folks dwelling around you are often in a similar demographic range financially, with the same motivation to control their environment. It is possible to live in a reasonably affluent subdivision in a nice house for years and not really be able to recognize many of your neighbors at the mall, if you’ve chosen not to interact with each other. Trust me…we did. It’s not that there isn’t poverty in suburban areas, it’s just not necessarily visible to everyone. 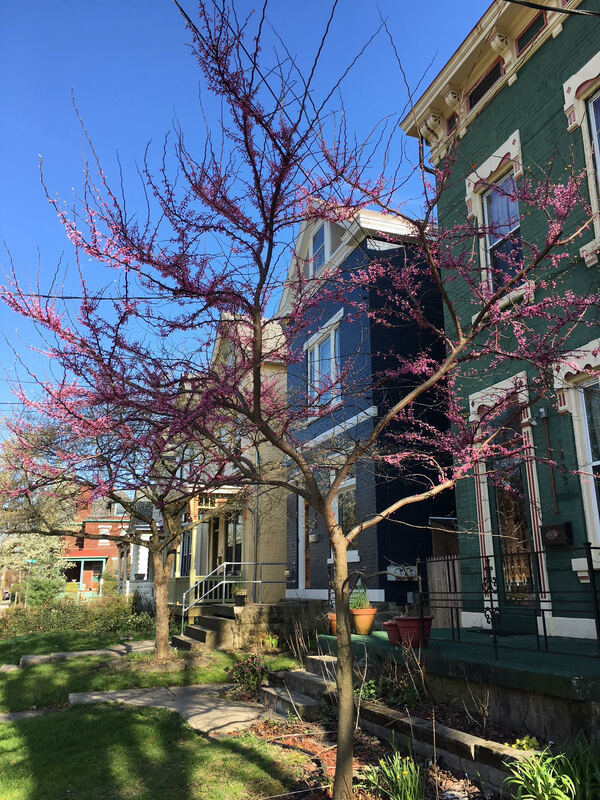 But moving to a much older and more diverse neighborhood, with smaller houses, smaller lots, and denser streets, has really forced us (in a good way) to live in an interactive way with our neighbors. While it’s been an amazing source of joy overall—we knew and had befriended more neighbors by the end of our move-in weekend than we did in the entire 11 years we lived in Liberty Township—it was also eye-opening. Walking around the neighborhood, you will see beautifully maintained houses, run down abandoned houses, and houses that you can tell the owners are struggling to maintain. You will occasionally see homeless people sitting on stoops of shops or sleeping on the sidewalk. Sometimes, somebody will walk by and you can tell they’re wearing old ratty clothing and multiple layers, even though it’s warm outside. It’s not all rainbows and unicorns. As a congregation, we’ve volunteered for the Peanut Butter Ministries, gone to Matthew: 25 to spend a morning unpacking products to send to countries who’ve been hit by disasters, and Hands Against Hunger for meal bag preparation. Some of this does stay in the community and help out locally (for instance, the last load of meal bags packed at Hands Against Hunger went directly to undeserved children in Greater Cincinnati), but there is no real exposure for volunteers to the people they’re helping. It’s absolutely worthwhile to help these causes, but they often don’t allow us to view outside the suburban comfort zone we’ve worked hard to build. That view, even if it’s just a peek through the window, is often a powerful way to understand the problem in a fundamental and emotional way. And in Cincinnati, we most certainly have a problem. I had never done research on what the poverty numbers are in our area, so I decided to do some digging and find more information. For the sake of keeping things more simple, I compared Mason to the City of Cincinnati. This does not include the suburbs, but the 52 neighborhoods that make up the City “proper”. In case you’re curious what neighborhoods this includes, I found this lovely map to show you where they are. A few places like Norwood and St. Bernard are their own city, but everything that is in color is part of Cincinnati. I chose Mason for my comparison, since I believe a lot of us either live or work here and it’s where Harmony originated. It’s a familiar touchstone. Frankly, I was shocked at these numbers. 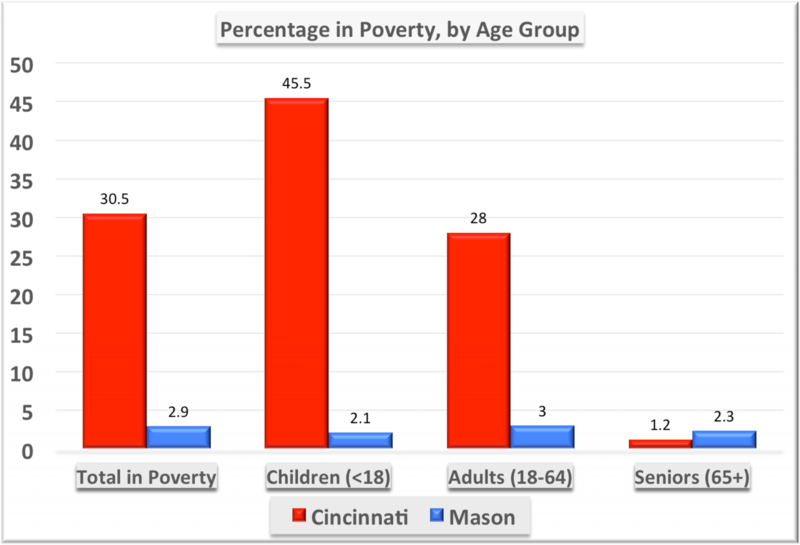 Almost a third of the people living in the City of Cincinnati are at the poverty level, compared to just under 3% of people in Mason. Even more shocking: nearly half of the children in the Cincinnati are at poverty level. I knew it was going to be worse in Cincinnati, but I had no idea it was going to be that drastically different. Obviously it’s not an evenly distributed number. Several of the neighborhoods in the city are of course very affluent (particularly on the East side), which means that poverty tends to concentrate in certain neighborhoods more than others. 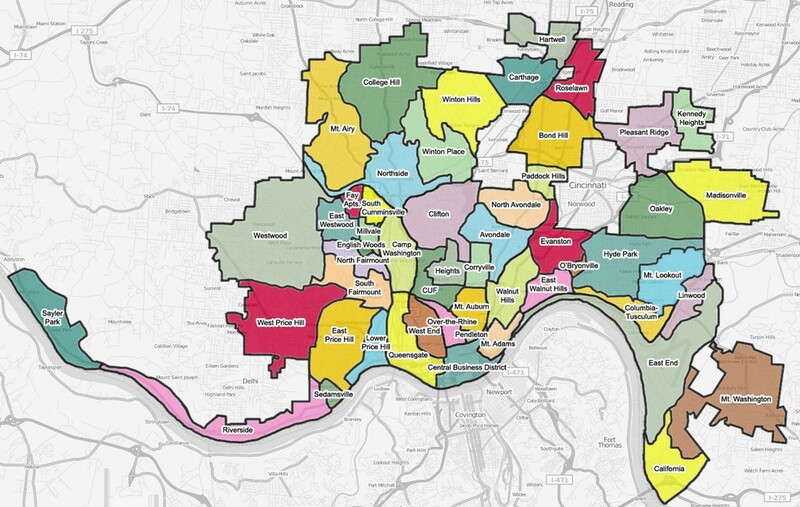 Northside and several adjacent neighborhoods have some of the higher poverty rates in Cincinnati. While the neighborhood is changing rapidly for the better, with a lot of investment and a surging real estate market, this is actually making it harder for many of the lower-income people who live in the neighborhood to stay in their homes and still manage to put food on the table. That sounds right up our alley, right? Our first principle is “The inherent worth and dignity of every person” and it’s right there in their mission statement. Also, this non-profit is so close to our house and serves our own community, so we wanted to be more involved. We have become a monthly donor and try to get engaged whenever they have events. We also were able to take a tour of the pantry, courtesy of Emily, where we learned what a modern, compassionate food assistance facility looks like. CAIN has three components, they collaborate with Interfaith Hospitality Network in the use of Grace Place in College Hill, which provides shelter to women and children in transition from homelessness. They have the Rainbow Choice Food Pantry, which offers day and evening hours for families to pick up food. CAIN treats their guests as just that: guests. Their motto is: “we feed bodies and souls.” So they really try to focus on ensuring that anyone who walks through their door is treated as a guest with dignity and respect. Guests literally shop in a market setting, with a personal assistant if required, making healthy choices based on their family’s needs, emphasis on choice. No one in your house likes canned asparagus? No problem, take the green beans. The entire process is carried out with dignity and respect, and the people who work there work tirelessly to serve their community. Because almost to a person, the employees of Churches Active In Northside LIVE in Northside. They are helping their neighbors. And they have Phil’s Place: a free community weekly dinner that provides food, fosters a sense of belonging, and builds community. Anybody in the community is welcome to attend and enjoy dinner and conversation with their neighbors. 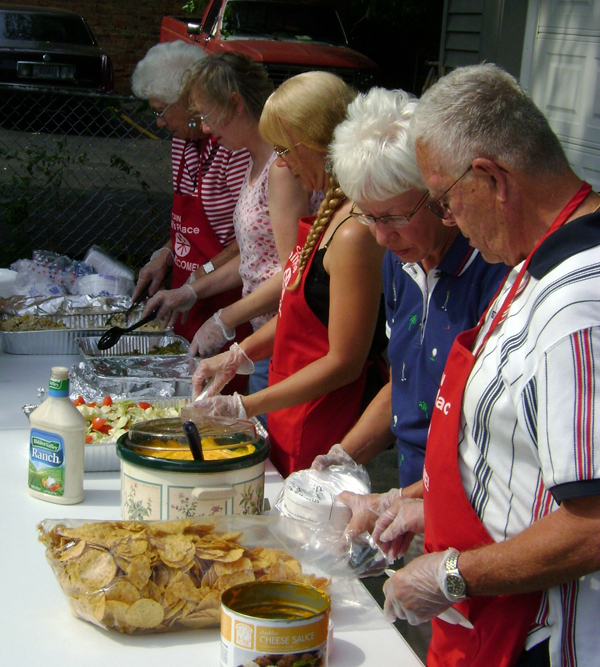 Typically a different local church or civic organization takes responsibility for preparing the meal each week. In this way, everyone has a hand in helping a community that is vulnerable to food insecurity. As you may expect, poverty and hunger go hand-in-hand. But food isn’t the only need for any family, and those needs are often just as vulnerable to financial insecurity. If you are struggling to pay utility bills, rent, mortgage payments or medical bills, you may have to make the decision of whether or not you will pay your bills or feed your family. Some families have none of the things we take for granted: toilet paper, feminine hygiene products, pots and pans, cooking knives. You cannot use SNAP to pay for toiletries and personal products, so many have to go without. When we did our tour of the pantry, we commented on how the beautiful loaves of donated artisan bread must go quickly. They actually don’t, because it isn’t sliced already and many homes don’t have a bread knife. The traditional sliced loaves go much quicker. This fact somehow rang particularly loudly to me…how fundamental is sliced bread? And that becomes a decision in someone’s life. Let’s be blunt here. Hunger and poverty is not just low-income families, the “chronic poor” or other negative connotations that get thrown around. Many of us are one medical crisis away from needing help to put food on our tables. Many, many others in our city have jobs that do not pay a living wage. These are the people that don’t show up on “unemployed” statistics, but minimum wage in most states will simply not stretch far enough to support even the most frugal of families. Multiple part time jobs can just barely cover the necessities, and any sort of interruption of that income can be disastrous. 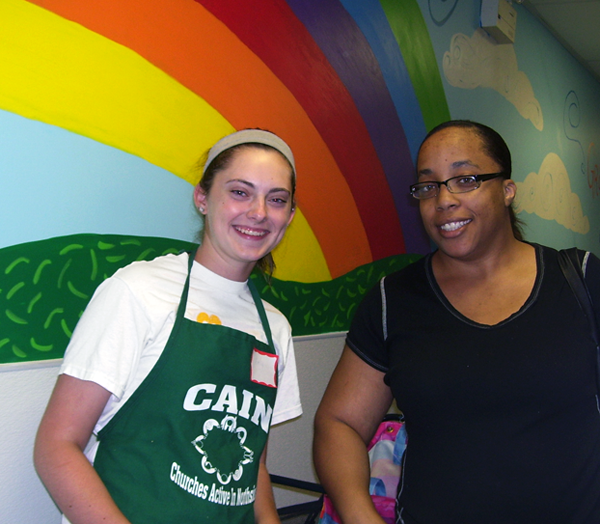 Organizations like CAIN and other local food pantries help to fill that gap. The people using the food pantry are just like you and me, families trying to keep their children fed and happy. It’s not us and them, it’s just us. The slide you’ve seen while I’ve been talking contains some testimonials from people in our community who utilize CAIN. You’ll note the variety of stories, and situations: a single mother of three, who suddenly had to take her nieces when her sister passed away—nearly doubling the number of children in the house; a part-time worker struggling to get by with a medical condition; a renter struggling to make rent and trying to keep their home. You can do a tour of a food pantry. Join the Harmony team at the Hunger Walk on May 28. Don’t buy things for people if you wouldn’t eat it or use it yourself. Unless you want to donate name brand products, because people love to have splurges like that or organic options. Whatever you do, don’t donate expired food. Nobody wants that. Set up a monthly donation to a charity you support. They depend on regular donations, kind of like building a budget. If we can step back to look at the big picture before we end, it’s worth noting the general trends in HOW we give. There’s this blog called Nonprofit AF that Emily told me about. I loved the header image on the blog, because who doesn’t love unicorns, so that’s why I have it on this slide. It’s about research that shows the way right-wing funders tend to give money to organizations they’re passionate about (think Pro Life groups, Political campaigns, the NRA, or insert many of the anti-whatever groups here) with no strings attached. Thinking, “Hey, I support that message, here’s some money!” If you like the message, these folks will know the right thing to do with your donation. But progressive funders tend to do more research about the charities they support. The research shows (and I imagine most of us in here would agree) that they don’t want their money to go to administrative costs, etc. and want specific things to happen with their money. How many of you have gone to the Charity Navigator website to determine which charity should get your money, making sure only the highest rated ones are who you support? I know that’s what I’ve done in the past. While critical thinking and a demand for accountability are great, this attitude can be counterproductive beyond a point. You wouldn’t tell a firehouse that you want to pay for the water or the hose, but not the person holding the hose. It might be better to use your critical thinking to get a solid understanding of the firehouse’s processes and people, then give with the confidence that those processes and people will ensure that your money goes appropriately toward the business of putting out fires. The blog post itself is pretty long, but I encourage you to take a look and read through it, it was a very interesting read. I think we need to do a better job of helping out our neighbors in need. These neighbors don’t have to be literally your neighbors, but in our city as a whole. We tend to live our lives comfortably and insulated from anything that’s difficult to see or understand. Try to push yourself outside of your comfort zone and see what you can do to help out. Emily King is a member of Harmony UU.